BEIJING • China's warships will soon be equipped with electromagnetic railguns, in a move that will put its fleet ahead of the rest of the world with some of the most advanced weapons technology, state media reported. According to the Global Times, breakthroughs have been made by the naval engineering team led by Rear-Admiral Ma Weiming in multiple related sectors, national television reported last Wednesday. Rear-Admiral Ma, an academician at the Naval University of Engineering in Wuhan, Hubei province, and his team have gained innovative results in electromagnetic-launching technology with fully independent intellectual property, cctv.com reported. The report came at a time when a Chinese landing ship, allegedly equipped with an experimental electromagnetic railgun, was caught on camera at an undisclosed location carrying out a trial run. However, the authenticity of the photo could not be verified. Last February, the same landing ship with the electromagnetic railgun was photographed in harbour, the Beijing-based Science and Technology Daily reported. 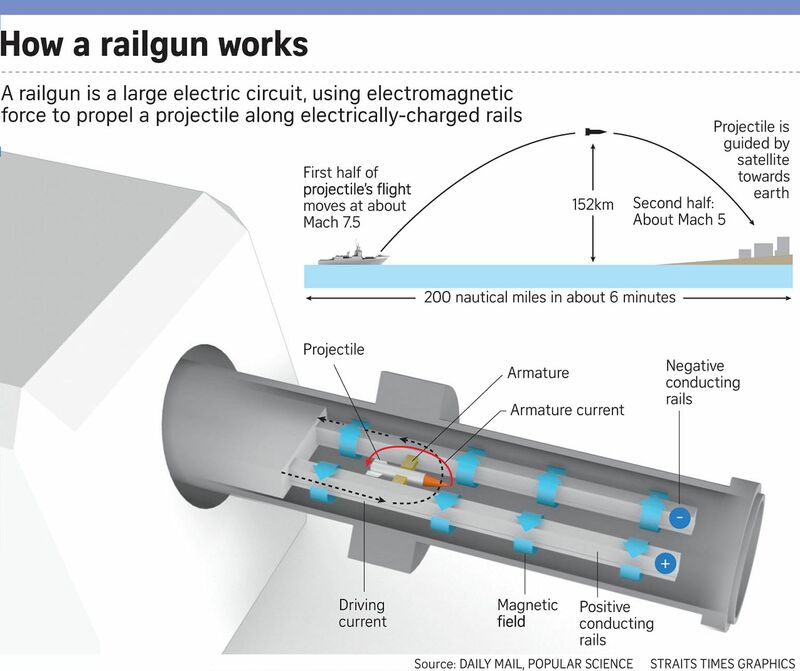 Mr Li Jie, a Beijing-based naval expert, told the Global Times last Thursday that China's electromagnetic railgun development has reached a mature stage after a series of tests. He said that if the recent trial run was true, it could be among the final tests before the weapon's delivery to the People's Liberation Army Navy. An electromagnetic railgun can fire projectiles via electromagnetic force at incredibly destructive velocity. It can reach farther ranges when compared with standard artillery, and maintain high accuracy, military experts said. The United States is also experimenting with the new weapon, but China will be the first country to actually equip a warship with it, according to the cctv.com report. China's naval electromagnetic weapons and equipment have surpassed those of other countries, the report said. Chinese military experts expect Type 055, China's 10,000-tonne-class guided missile destroyer, to use the electromagnetic railgun. Meanwhile, China has tested its most powerful non-nuclear weapon, dubbed the "Mother Of All Bombs" by official media in a reference to a US munition used in Afghanistan, reported Agence France-Presse. In a short video published on the website of state arms manufacturer Norinco, the massive bomb drops onto a plain and produces a gigantic ball of fire and black smoke. The bomb - whose strength is second only to that of a nuclear weapon, according to the official Xinhua agency - was dropped by a Chinese H-6K bomber. No details on the date, location or range of the bomb blast were provided.